IsoTek came on the scene a few years back as a specialist in mains filtering and conditioning and it has remained constant in that aim. After a very brief hiatus early in 2009, the company is now back in business and continues to evolve its range with the release of the Aquarius. This particular mains filter is a replacement for one of the most significant and best-selling IsoTek products, the 'Gii Mini Sub'. Positioned above the entry-level products such as the Sirius and basic IsoPlug/ NeoPlug filters, but well short of the high-end Titan and Nova, it could still look like quite an expensive luxury to anyone not yet convinced of the virtues of dedicated mains conditioning. Like most midrange mains conditioners, the Aquarius has several outputs – six, in fact. They are not simply connected together inside, however, but are to a large extent individually filtered. Two of them are high-current outputs intended to feed power amps and these two are connected in common through a large common-mode choke within the unit. The other four outputs are suitable for lower current devices (though their five amp rating means they can perfectly well be used with the thirstiest of source components and, indeed integrated or power amps of lowish output). Each of these has its own set of filtering components; inductors, capacitors and transient absorbers. There has been plenty of discussion among tech-heads as to what kind of filter is most suitable for high-performance audio applications. It might, at first, appear that there aren't many variables, but in fact there are dozens of them, the most significant being the way filters affect the three mains wires (live, neutral and earth) relative to each other. In the ideal situation, apart from the obvious need to maintain 240-Volt AC at 50Hz between live and neutral, there should be no voltage difference at all between the wires. If those simple conditions are met and all hi-fi components are fed from the same conditioner so that they all see the same 'ground' reference, mains quality will have been optimised. Of course, putting that into practice is a good deal more complicated than it may sound, due to all sorts of factors. One of the problems filter designers must deal with is the way audio components draw a current from the mains that is highly non-linear, containing dozens or indeed hundreds of harmonics. Because of that, there is a real possibility of 'over-filtering', limiting the current that the audio equipment actually needs to operate at its optimum and finding the balance between that and genuinely useful filtering is where all the clever stuff happens. In addition, mains interference covers a vast spectrum and includes both relatively low-level noise and occasional high-voltage spikes. IsoTek's approach is fairly gentle in filtering terms, seeking to limit the amount of very high-frequency noise without compromising performance in terms of power delivery. The use of separate filter subsections for each output, in principle violates the rule suggested above, of feeding all components with exactly the same mains signal, but is a sensible compromise that recognises the near impossibility of achieving perfect filtering (in this or any other electronic application): more importantly, it prevents one component in the system from interfering with others via the mains. In addition, the whole design of the Aquarius is such as to allow large currents to be drawn without either reducing filter effectiveness or causing more basic risks such as overheating. IsoTek has even fitted a 20-amp AEC mains inlet to maximise safe current handling, arguably a sensible move, not least because it reduces the chance of a user absent mindedly connecting up using a low-current IEC lead. Of particular note is the very high surge current ability in the face of transient over-voltages on the mains. Realistically, the capability here is vastly in excess of what one might ever expect to see in practice, which should give peace of mind at least. Overall fault current protection is provided by a circuit breaker for the high-current outputs and a fuse for the low-current ones. 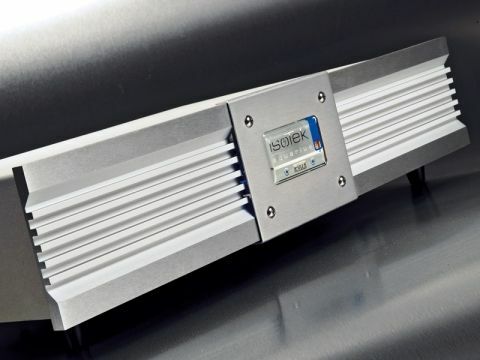 If there's one thing that all mains conditioning designers, vendors and users agree on, it's that the precise nature of results for a given unit will vary a little depending on what units – sources and amplifiers – it is supplying. It's clearly useful to try any conditioner with various components and we accordingly tested this one with quite a wide range of sources and amps, including trusty old favourites, units kept for just such eventualities, as well as units that had been submitted for review. We can't pretend to have been truly exhaustive, but we did get a pretty clear idea of what an Aquarius purchaser can expect. At worst, the improvements wrought by the Aquarius are small. At no time, though, did we feel that its addition to a system (compared with no conditioning at all, that is) was a cause of back-sliding in sound-quality terms. Neither it, nor any other conditioner we've tried, has a vast effect on LP turntables, though if you have a socket spare after plugging in more sensitive components a turntable is still likely to benefit. Its effect on a couple of high-end CD players was also quite mild, probably because both machines have clearly had attention paid to mains filtration internally. At best, the lift in performance is quite remarkable. Particularly with amplifiers of all kinds – pre and power, valve and solid state, high and low power – we found that there is almost invariably a considerable gain in both analytical precision and musical insight. It feels rather as if the recording has just been brought into slightly sharper focus. In fact, a visiting listener put this rather nicely, when he commented that it sounds as if one has just found the original LP, having previously been listening to a good cassette copy. We were scarcely less impressed by the effect on a handful of mid-range CD players. There seemed here to be rather more variation in the precise nature of the improvements but again we heard more precision and in a couple of cases what sounded like more bass – obviously impossible, taken literally, but explicable as clearer reproduction of low frequencies leading to better perception of musical instruments operating in that range. Perhaps the most obvious improvement was yielded when we tried the Aquarius with an elderly, but very fine FM tuner, which really stepped up a gear and, in slightly similar vein to the CD players' bass, seemed to acquire a little extra treble extension too. In this case, it really did sound as if a new model of tuner had been put into the system. That brings us to the hard question: how do the improvements relate to a full-scale upgrade, say to the next model up a manufacturer's range? On the whole, we'd suggest they are typically of about that order or, perhaps, a little less. on that basis, if you have to choose between, say, a £1,000 amp plus Aquarius or a £1,800 amp from the same range, generally it's a no-brainer – go for the latter, or even a £1,400 model. But one Aquarius can feed a whole system and will most often be an upgrade. As such, it's actually very good value as it can lift a fundamentally competent system by more than one is likely to achieve spending a similar amount elsewhere. On that basis, we're more than happy to recommend it.